This year I’m loving some of the unexpected places to find this cool combo. You don’t have to commit to an entire room makeover, just add a few simple pieces to update your space. I am in love with this flatware from DVF Home. I know these are “technically” a DIY for Halloween themed decor, but wouldn’t they be lovely in some pristine, modern candlesticks? This one’s fairly straightforward. I’ve even got a DIY version for my own home. For a more modern look, opt for a base with a simple shape and clean lines. 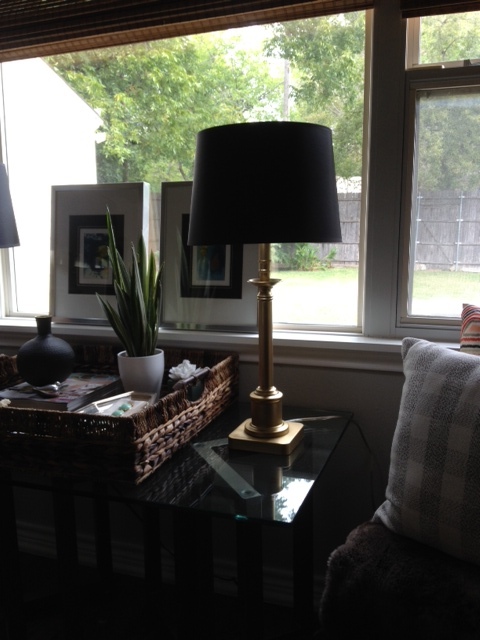 A quick and easy way to add a bit of Black and Gold charm to any space. Loving this heart pillow, too! Do you love Black and Gold? ← 5 DIY’s I’ll Probably Never Get Around To Doing… But Really Want To. Love your selection of pieces in black and gold. Haven’t really thought about this combo in a long time but after seeing it here I might think of using the two together. At first glance, it took me back to my childhood which is a while back and can still see my mother’s lamp and serving tray in this partnership color. Thanks for sharing and memories. You’re so welcome, Patty. Thanks for sharing! I love when old trends come around again. They tend to bring all sorts of memories with them! I know. It’s my favorite!